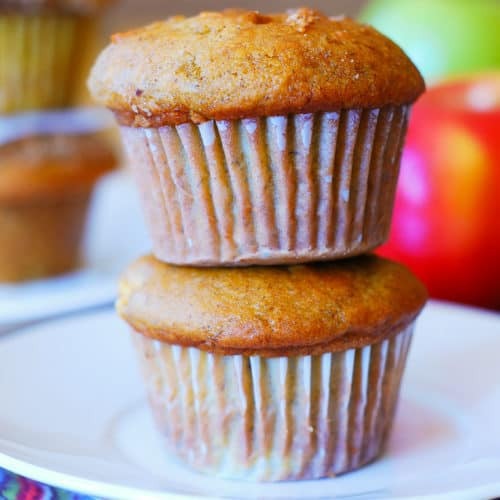 Pumpkin Banana Apple Muffins with Apples and Cinnamon – delicious, low-fat Autumn muffins made with pumpkin puree, mashed ripe banana, diced apples, Greek yogurt, cinnamon, and vanilla. Only 2 oz of butter are used to make 12 regular size muffins. The rest of butter is replace with ripe bananas and Greek yogurt. Are you enjoying the pumpkin season? I certainly am! I never thought I would enjoy pumpkin muffins so much until I made these. And you will want to make them too once you read what they are made out of. 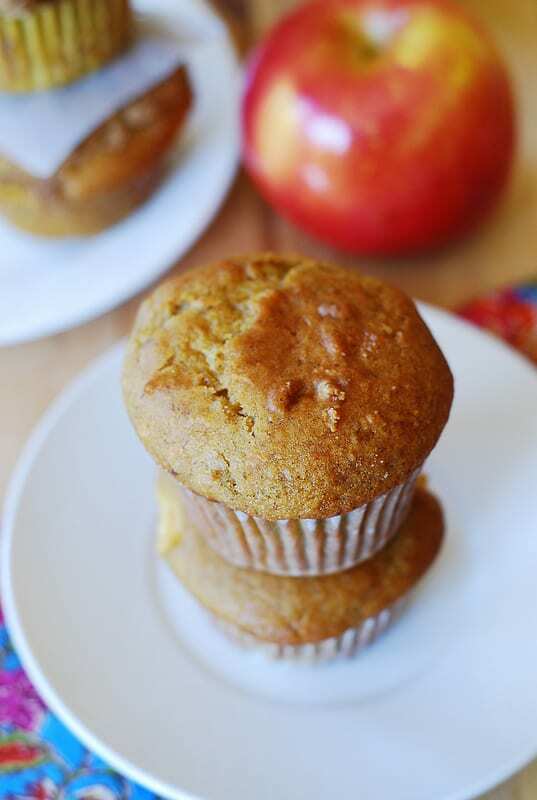 Please meet pumpkin banana muffins made with Greek yogurt, chopped apples, cinnamon, and, not least importantly, these are low fat pumpkin muffins with only 4 tablespoons (or 2 oz) of butter for a whole regular 12-cup muffin pan! These muffins are so airy, fluffy, and cake-like that I almost want to call them cupcakes, except that there is no frosting on top. And these don’t even need frosting. They are THAT good! I’ve been eating them for breakfast, dessert; they became my favorite lunch snack at work in addition to these apple banana muffins with pecans. A pumpkin muffin takes on a new meaning when you add very ripe mashed bananas, Greek yogurt, cinnamon, and chopped apples to it. It becomes something you crave for day and night. Very ripe bananas make everything better. I am sure this could become your new favorite muffin recipe! PUMPKIN BANANA MUFFINS made with Greek yogurt, chopped apples, and cinnamon are calling your name!!!!!!!!!!!!!!!!!!!!!!!!!!!!!!!!!!!!!!! 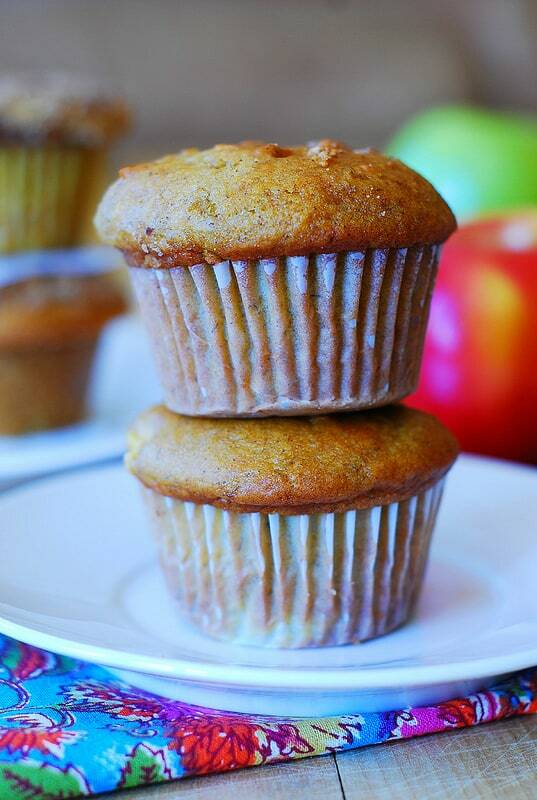 Pumpkin Banana Apple Muffins with Apples and Cinnamon - delicious low-fat Fall treat. Made with pumpkin puree, mashed ripe banana, diced apples, Greek yogurt, cinnamon, and vanilla. Perfect for breakfast, lunch snack, or dessert. Only 2 oz of butter are used to make 12 regular size muffins. The rest of butter is replaced with Greek yogurt and mashed bananas. In a medium bowl, using electric mixer, beat 4 tablespoons of butter and 1 cup of white sugar on high speed for 1 minute until well-combined. You will get coarse looking mixture (not creamy). Add 2 eggs to the butter-sugar mixture and continue beating for another minute until very creamy and very smooth. Add mashed bananas, Greek yogurt, pumpkin puree, and vanilla extract to the butter-sugar-eggs mixture, and continue beating, using electric mixer, until well combined – for about another minute. In a separate medium bowl, combine sifted flour (do not overpack the flour, when measuring it using measuring cups! ), baking powder, baking soda and cinnamon. Mix until well combined. Add dry ingredients into wet ingredients, and mix, using large spoon, just until combined. DO NOT OVERMIX. If there are lumps – they will work themselves out during baking. Fold in apple chunks. Place the muffin cup liners into the muffin pan. No need to grease the pan or muffin cup liners. Fill muffin liners 3/4 full. Bake for about 25 minutes. 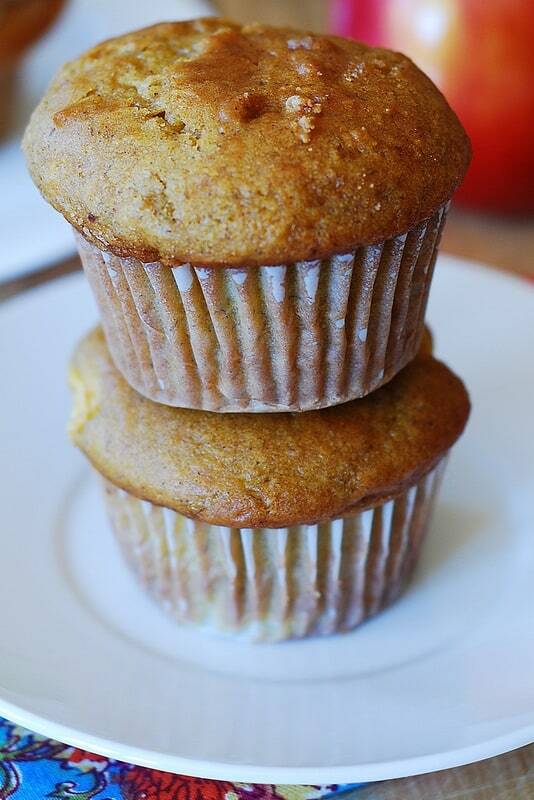 Cool on a rack for a little bit, then remove pumpkin banana muffins from the pan and let them cool some more. Made these this morning. Found them on Pinterest. I thought it was an odd combination but they turned out great. Made Muffie tops out of them. Added chocolate chips. I liked the no oil in the recipe. I cut the sugar back a bit too. But that’s a personal preference. They turned out wonderful. Definitely a keeper of a recipe.